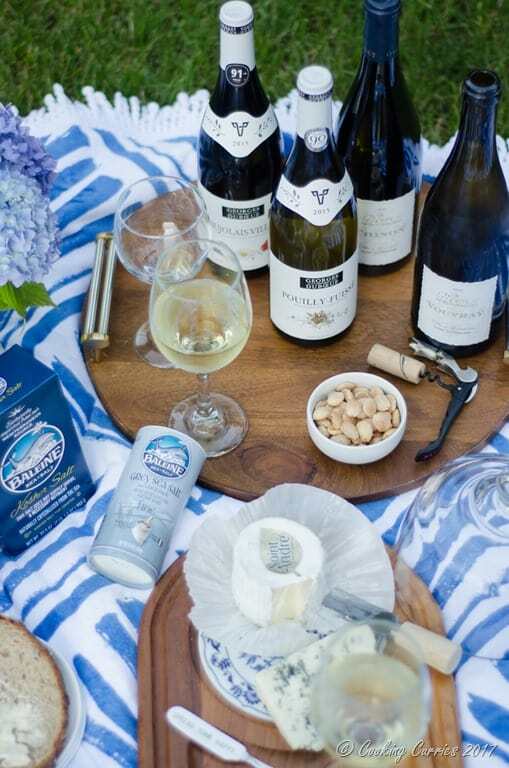 Create the perfect setting for a French inspired backyard picnic, while you enjoy French wines, cheeses and salts along with some delicious Warm Wild Mushroom Salad. Who doesn’t want to be in the French countryside, enjoying a glass of French wine, taking in all the scenes and enjoy some simple but delicious bites?! I do! But, if you cant get to France this summer, you can always bring France to your backyard! That is what we are going to learn how to do, in this post. Read along with me, will ya?! A comfortable setting – with enough space to spread out your goodies and also for you to comfortable sit and relax. 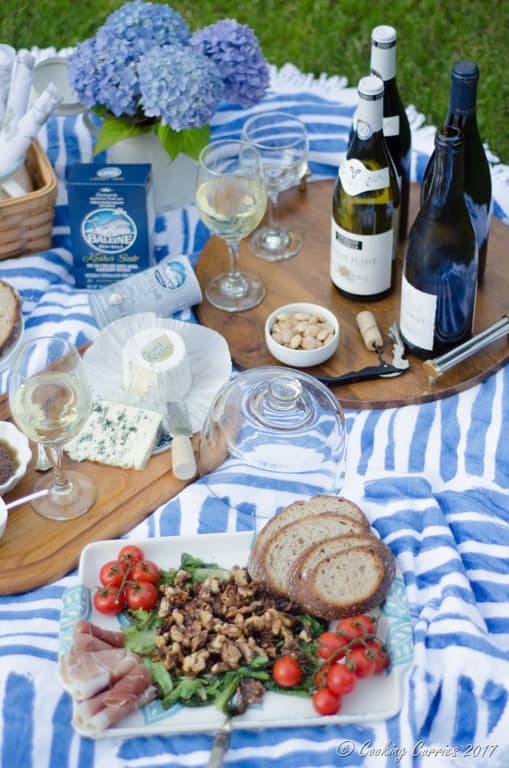 Trays, trays, trays – I have always found that having some trays as a sturdy base helps you focus on enjoying the picnic than worrying if your glass or bottle or jar will topple over and spill everything in it. Food and Drinks – picnics are best enjoyed when there are lots of small bites and everyone can keep helping themselves at all time. And of course, there needs to be some great drinks – premade cocktails or a few bottles of wine. Napkins and flatware – just because you are outside, doesn’t mean you have to rough it out. You can still keep it classy with some not-so-fancy cloth napkins and mix and match flatware. And of course, remember to take with you some acrylic wine glasses if you are pouring wine. A little extra – add a bouquet of flowers for an extra special touch to the picnic scene. It doesn’t have to be a fancy bouquet, just some beautiful flowers picked up from your backyard will be perfect for the setting. 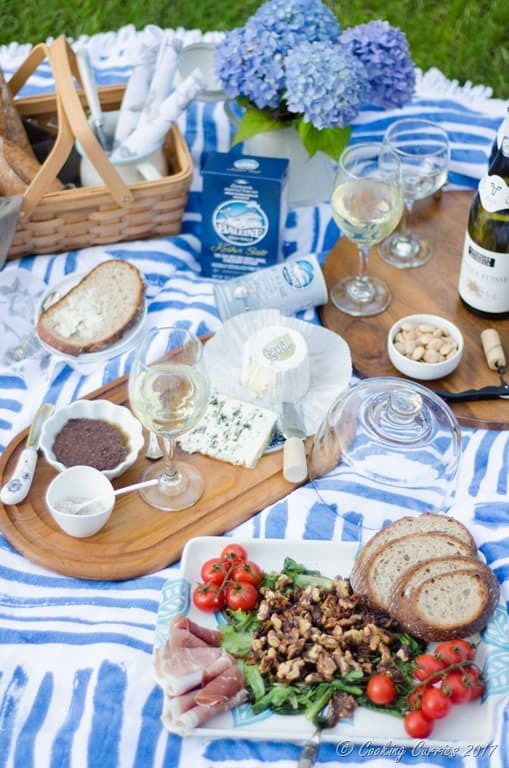 If it is a summer picnic, you will definitely want to have some white wines with you along with a couple of reds, just to make sure that everyone has something they like to drink. Remember to chill the white wines, well ahead. We had four wines with us for our picnic. Saget la Perrière , Chenin Blanc : Marie de Beauregard Vouvray 2015 – This is a sweet and fresh white wine from the French region of Vouvray of the Loire Valley. It is a 100% Chenin Blanc with a beautiful pale gold color and has a sweet pear, honey and citrus notes to it. It was the perfect wine to start the picnic with. Saget la Perrière , Cabernet Franc : Marie de Beauregard Chinon 2015 – A beautifully smooth and well balanced wine from the Chinon region of Loire Valley. A 100% Cabernet Franc with fruity aromas of blackberry and some woody and sweet spicy notes as well. A great red wine for summer. Georges DuBoeuf, Chardonnay : George DuBoeuf Pouilly-Fuissè 2015 – A 100% Chardonnay from the Pouilly-Fuissè , in the southern part of Burgundy. This region is famous for its white wines, so you can imagine how good this wine is. A light wine with some pear and peach notes to it that can easily be enjoyed by itself or with some light food as well. Georges DuBoeuf, Gamay : Georges DuBoeuf Beaujolais-Villages 2015 – A very light bodied red wine with a smooth mouth feel to it. It has hints of cherries and raspberries with some subtle earthy notes and floral aromas. It is a 100% Gamay – a wine that is similar in taste to a Pinot Noir. It was my first time trying a Gamay and I have to say I loved it! As for the nibbles, we had two cheeses from the French region, along with some baguette and some rustic bread slices as carriers. Ile de France , St. Andre – A smooth as butter cheese, that is a French triple cream cheese that is so rich and has a unique salty flavor to it from the ocean air blowing through the Normandy pastures. If you haven’t yet tried Ile de France cheeses, this is a must try, along with their Brie and Goat Cheese, as well as this St Agur. Ile de France, St Agur – A robust, rich yet creamy blue cheese. Due to its creaminess, it spreads easily on your baguette or crackers and also can be used in a sauce as it melts very well too. These cheeses are easily available at Whole Foods and Trader Joe’s and does not cost a whole lot more than any other good cheese you would buy from there! Now, French Sea Salt is something that is not to be missed if you are going for a full French gourmet experience. We had the La Baleine, Kosher Sea Salt and the La Baleine fine grey Sea Salt from Guerande. The fine grey sea salt is so purely brine-ey, that you can just pop some in your mouth as it is. We sprinkled them on our baguette with cheese and tomatoes and it took that little piece of bread to a completely different level altogether. This particular grey sea salt is very rare and can only come from the Guerande region. They are also very eco-friendly and do not leave any carbon foot print of their own, whatsoever. The La Baleine Kosher Sea Salt was great for the Warm Wild Mushroom Salad. As for other nibbles, I had some crackers, roasted almonds, olive tapenade, some prosciutto, fresh cherry tomatoes along with the warm wild mushroom salad and some grapes and berries to finish it off with. 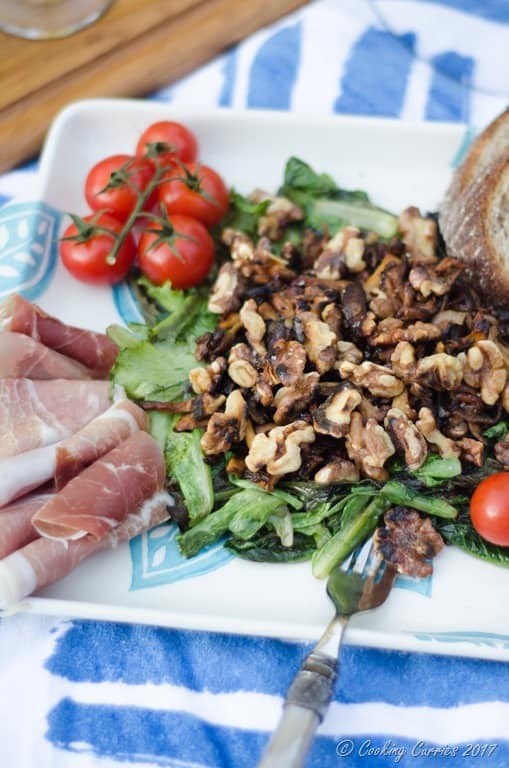 Now that you have everything you need to create the perfect French inspired backyard picnic, that is Made in France and Made with Love, lets move on to the recipe for the Warm Wild Mushroom Salad. 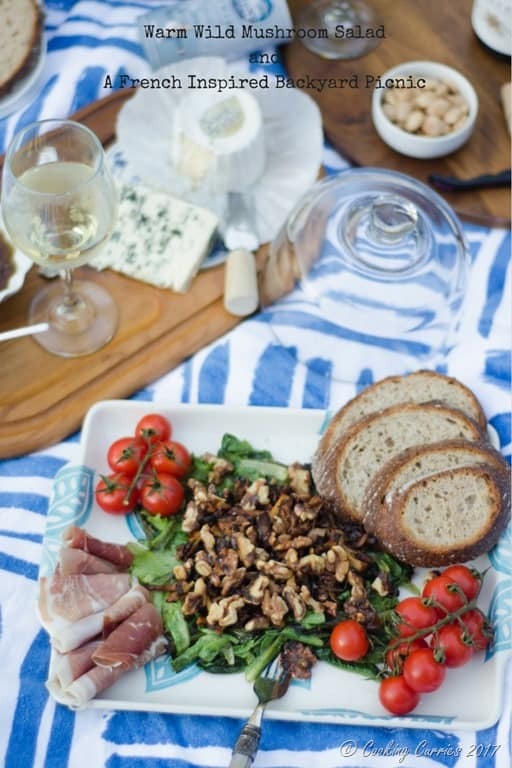 Ha – trays are definitely needed in the back garden – I have lost one or two glasses of wine over the last few summers by they tipping over:( Love this mushroom salad – it looks extremely tasty and since its so quick to make it fits well into the easy picnic theme. Strong cheese, mushrooms and wine…I’m in heaven! I love your choice of cheeses they’re some of my favourites! Oh, this is heaven, no one says no 🙂 mushroom salad sounds delicious! That looks like my kid of picnic for sure! Always essential to have a glass of wine too! This is one heck of a spread! I love cheese and wine! The salad looks perfect for a picnic. Yes, that is perfect for the picnic and that salad looks healthy also.